I have an addiction to Kombucha Tea. I started making Kombucha tea for my 5yo who is healing from alot of tummy issues after numerous courses of antibiotics and a recurrent c.diff infection (which has since cleared) and got hooked myself. It’s now my go to drink when I feel like I need a little pick me up. My kids love it also. Kombucha tea is a detoxifying naturally fermented beverage with many health benefits. It is made with sweetened black or green tea, a SCOBY (Symbiotic Colony/Culture of Bacteria & Yeast) and some starter tea (already fermented tea), as the bacteria and yeasts feed on the sugar it creates a carbonated probiotic drink which can be flavoured with your favourite fruit, herbs and spices. The first fermentation takes at least 7 days to 14 days. The best way to check when you first start making kombucha tea is with a PH strip. The first fermentation should read 3.0, anything above you should leave for another day and recheck, anything below 2.8 will be quite strong and vinegar like (which is great for dressings and dips). After a few batches and some gained confidence, you can just go by taste. You can drink your kombucha as it is or you can flavour it with a second fermentation (see my recipes page here). With each new batch a new SCOBY forms on the top, the beginning stages of the new SCOBY can look scary! I had to keep googling images to make sure it looked right. I was terrified of mould which I read can happen – I have since learnt this is quite rare and usually it’s caused when the there isn’t enough starter tea or some mould spores contaminating the batch. If you are wondering about mould and how to tell, the mould looks like it would on bread or cheese, circular, fuzzy and very clear that it is mould. If this ever happens, throw the entire batch out and clean the jar with hot water and distilled vinegar before making a new batch. The forming SCOBY is one funny looking growth with patchy solid bits and some translucent bits, sometimes it just doesn’t form into a smooth ‘pancake’ looking thing either, it can have a few bumps and brown stringy stuff hanging from it (totally ok, it’s just the yeast). I recommend not checking in on it for the first 7 days if you can! I couldn’t help myself for the first few batches but now I know to leave them alone so the new SCOBY has a chance to form nicely. If you bump or move the jar, the new forming SCOBY may drop from the surface, so it will need to start again on the surface, it’s best to keep it somewhere you will not have to move too much. All you need to start your first batch is a SCOBY and some starter tea, if you have a friend who makes Kombucha tea, you can ask them for a spare SCOBY, otherwise if you live in Australia or Vietnam, you can buy a SCOBY here or if you live in USA, Canada & elsewhere you can buy one from Kombucha Kamp. The tea should be room temperature, if it is still warm, leave it for some time or stick it in the fridge with a timer set and return to check the temperature. If unsure whether it is cool enough or the jar still feels warm, leave it for 10-20mins to be safe. be patient with the cooling, it will be worth it! Keep the jar preferably somewhere in the cupboard away from light, other ferments and strong smells. Keep the cupboard door ajar at night to allow the SCOBY fresh air. 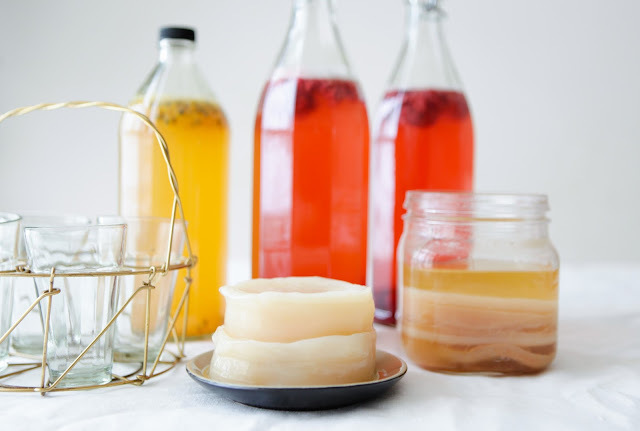 Need a Kombucha SCOBY? Buy one here in Australia or Vietnam or go to Kombucha Kamp for USA, Canada & Worldwide. I’m currently growing my own SCOBY to make my first batch of kombucha. Just doing some research to see how it’s done. You have good, clear directions. One question…can you store “extra” SCOBY’s in the fridge to keep them longer if you’re not using them? So I must have my home too warm. I get a lot of brown “yeast in my Kombucha. I also had too many scobies in 1 jar. It was a hotel itself. Should I wash off the brown yeast or start with a new scoby? Thank you!